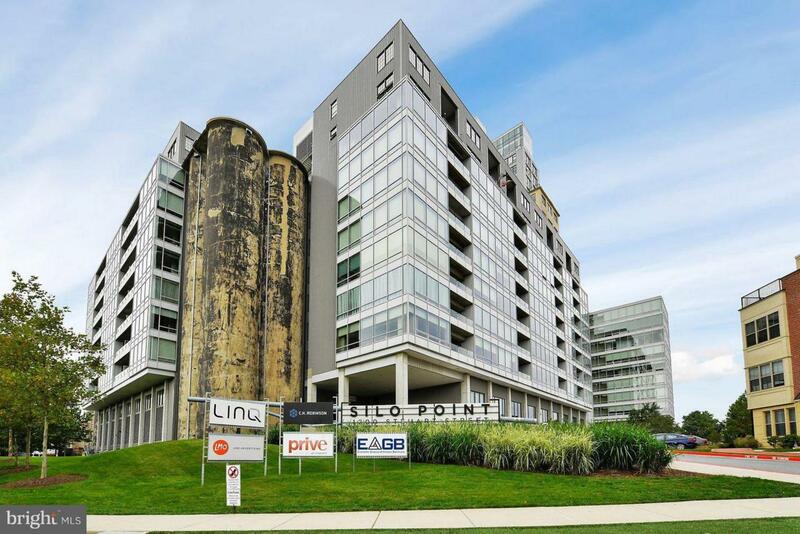 Enjoy the ultimate urban lifestyle experience in Baltimore's award-winning Silo Point! Overlooking the harbor, these waterfront residences offer impressive industrial architecture with contemporary, upscale finishes. And you get so much more at Silo Point with private and secure living surrounded by a great community of people! Soak in the terrific design at every turn, in your own living space and the common areas. Take your dog for a walk or run on the beautifully landscaped grounds or in the charming surrounding neighborhood. Or grab your day pack and head out to one of your favorite eateries or city destinations. This rarely available end-of-group in Sky Town boasts a large private terrace for the city dweller who just has to spend time outdoors. Freshly painted with stylish hardwood floors throughout. The gourmet kitchen features granite and stainless appliances. Enjoy the view from the third-floor master suite with balcony, private spa bath, and custom walk-in closet. Second bedroom has en-suite bath and double closets equipped with closet systems. Plus there's a bonus den/office, separate laundry room, and large storage room! Incredible community amenities include the Sky Lounge with 360 views of the city, available for private parties, just relaxing with a book, or gathering with friends! Great fitness and wellness center, yoga and pilates studio, game room, wine vault, 24-hour front desk and concierge services, and excellent support staff and management. Outdoor terrace furniture is included so you can start enjoying your new lifestyle the very first day! And two prime garage spaces only steps from the elevator complete package! Listing courtesy of Riley & Associates.